Rachael absent-mindedly left her phone at Safeway, a grocery store chain. Leaving things behind is a normal thing: it happens to everyone, even if you won’t admit it. 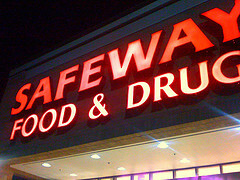 What isn’t normal is what happened between Rachael and Safeway in the days afterward. She was lucky that no other customers wandered off with her phone, and that the store held on to it for her in their safe. At least, that’s what they said part of the time. 07/17/13: I leave phone on counter at a Safeway in [redacted] while helping bagger pack the food up. Get home, realize my mistake, borrow a phone to call them. A woman at customer service confirms they have my phone in their safe and are holding it under my name. They tell me I can come pick it up at my convenience. 07/18/13-07/20/13: Upon going to retrieve my phone, I am told they no longer have my phone. No explanation is proffered except a general hinting at theft, and assurance that they have triple-checked the safe and office. They dodge my requests for them to contact the people who found/logged the phone, to look at the video surveillance, to check the log book. I give them my email but do not receive any updates. When calling to check in, I am asked if I am sure it was not X iPad or Y camera. I ask when the manager is in, and I am told that they “cannot give out employee hours”. 7/20/13: I get an email saying they have my phone, after all. It was “hidden under paperwork”. Upon revisiting the store, I recognize my original cashier. He hands me the phone and tells me it was on the office desk the whole time. When I asked if he knew that the entire time, he says yes. When I ask if anyone had asked him about it over the past few days, he says no. The whole thing was weird and uncomfortable. Not too happy with Safeway right now. That is kind of odd. It’s not fair to depend on a grocer to hold on to your stuff for you, but this experience was confusing. Safeway had her phone, except for when it didn’t, and they were keeping it in the safe, where it never was to begin with. Got it.